There were 615 press releases posted in the last 24 hours and 153,911 in the last 365 days. "Offshore Voluntary Disclosure Program” (OVDP) ends September 28, 2018, reminds Tax Attorney Richard Lehman (Florida). Thereafter, penalties will be higher. BOCA RATON, FLORIDA, UNITED STATES, September 15, 2018 /EINPresswire.com/ -- For only two more weeks, taxpayers with undeclared foreign bank accounts & assets have the opportunity to report such accounts and come into compliance (with reduced penalties) under the IRS “Offshore Voluntary Disclosure Program” (OVDP). OVDP is a voluntary disclosure program for taxpayers who have hidden foreign bank accounts, and wish to avoid potential criminal liability and/or substantial civil penalties. It begins by providing IRS Criminal Investigation (CI) with the taxpayer’s name, address, taxpayer identification number and date of birth. IRS then issues a “pre-clearance letter” and taxpayers proceed with a more complete disclosure in the form of a summary letter with exhibits (“Offshore Voluntary Disclosure Letter”). But soon this program will end. After September 28, 2018, taxpayers will no longer be able to receive IRS clearance in advance (CI) to avoid severe penalties. It is thus extremely important for taxpayers to take advantage of clearing their unreported foreign bank deposits and other assets in the waning days of the OVDP. 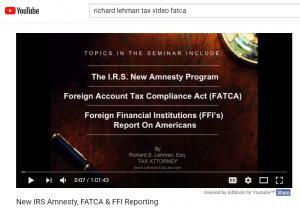 Richard Lehman, a respected Tax Lawyer based in Florida, today reminded U.S. taxpayers of this September 28, 2018 deadline for reporting hidden foreign bank accounts, and recommends that affected taxpayers seek expert tax advice based on their specific circumstances. It is not prohibited for U.S. taxpayers to maintain assets outside the U.S. 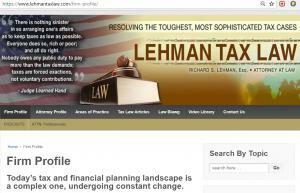 But problems arise when such assets have not been notified to the U.S. Internal Revenue Service (IRS). Some U.S. taxpayers may be unaware that such bank accounts must be declared to the IRS. Others may intentionally hide such accounts from the IRS. There is a legal requirement that all of these foreign bank accounts be reported to the United States on an annual basis, and that United States income taxes be paid on all of these bank deposit funds. The Foreign Account Tax Compliance Act (FATCA) requires that foreign financial institutions report the foreign assets held by U.S. taxpayers, or be subject to withholding on withholdable payments. FATCA is an important tool to fight tax evasion through foreign assets, requiring U.S. taxpayers with foreign financial assets outside the United States to report such assets. Other penalties that may apply. There is a penalty for failing to file Form 3520, Annual Return to Report Transactions With Foreign Trusts and Receipt of Certain Foreign Gifts. The penalty for failing to file, or for filing an incomplete return, is the greater of $10,000 or 35 percent of the gross reportable amount (with certain exceptions). Further, there is a penalty for failing to file Form 3520-A, Information Return of a Foreign Trust With a U.S. Owner. Taxpayers must report ownership interests in foreign trusts. The penalty for failing to file each one of these information returns, or for filing an incomplete return, is the greater of $10,000 or 5 percent of the gross value of trust assets. 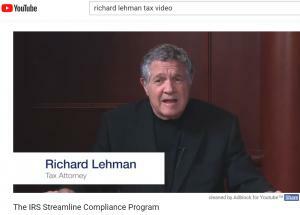 Mr. Lehman’s video about The IRS Offshore Voluntary Disclosure Program is at https://www.youtube.com/watch?v=sQnH7Vx0jRM. This presentation was recorded live on October 2, 2014 during the CPA Academy Live Webinar. 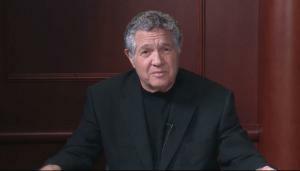 The objective of this presentation is to advise practitioners and taxpayers of new IRS' rules and regulations governing the report and the taxation of income from foreign bank accounts and foreign assets; and the penalties and relief provisions resulting from the holding of unreported foreign assets and foreign bank accounts by United States taxpayers.